Nine restaurants, lounges and bars, plus 24 hour in-room dining, offer plenty of options of cuisine, indoors or out, light or substantial. The Oasis in the lower lobby offers an international buffet breakfast and a la carte lunch and dinner, from early till late. 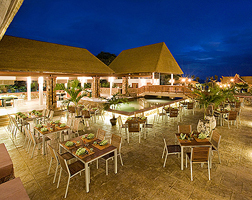 Ginger and Lime is all about Thai and Asian flavours, in the evening, in the resort gardens. You can enjoy modern Italian cuisine, with an emphasis on seafood, in Acqua. Flames is for the BBQ lover, on the beachfront. For more beach bar and oceanfront dining, Oceans is an all-day option. Zico’s Brazilian Grill and Bar lays on a Churasscaria buffet, whilst Zulu is a lively bar with DJ and private karaoke rooms. Vistas is a modern and very chic lounge, in the main lobby. Finally, Waves is the pool bar, with light refreshments and snacks.